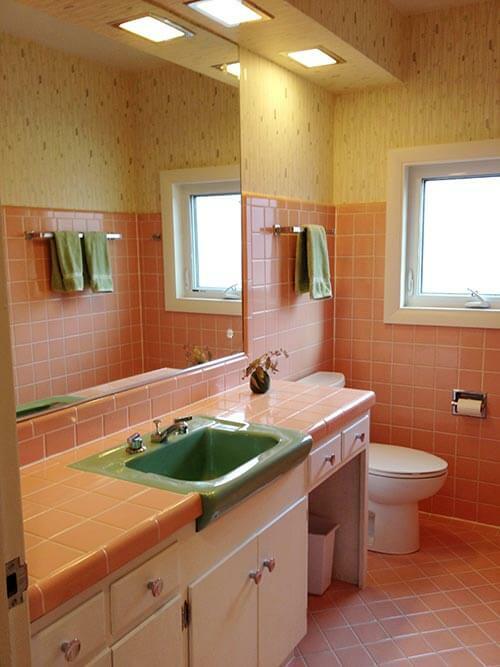 Reader Brty says that reading Retro Renovation inspired her family to buy their 1956 house — with not just one, but two lovely pink bathrooms. The moment she first laid eyes on them, Brty says she loved the two pink bathrooms, although the men in the house took a little more convincing. Once the family was fully on board, Brty wasted no time and began spiffing up her two lovely bathrooms up for their next half century of service. And yum! We adore seeing some of our favorite wallpapers — vintage style wallpaper from Bradbury & Bradbury Art Wallpaper’s Atomic Age collection — in these spaces. 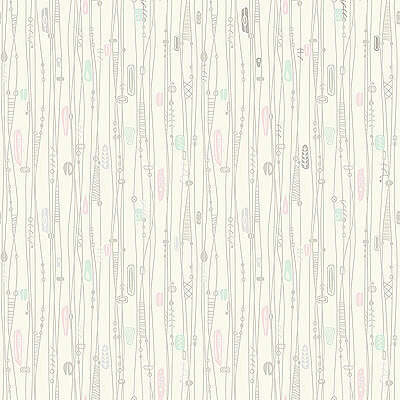 These wallpapers — with their lovely graphics, colors and metallic sizzle — really make these bathrooms sing. 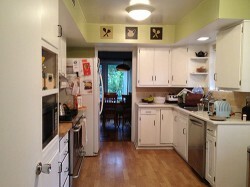 Oh, and Brty remodeled her worn kitchen, to. Read on for the details on both her bathroom and kitchen updates. LOVE YOUR BLOG!! Look at it all the time!! 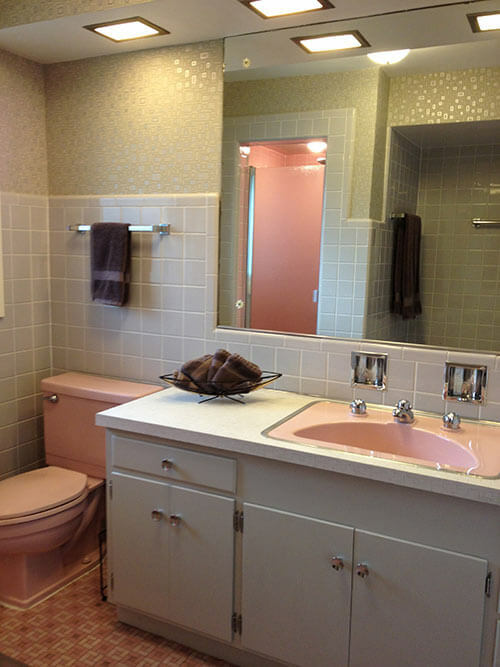 And Looking at the blog inspired us to buy our 1956 house with not one, but two mint (almost) condition pink bathrooms!! 🙂 Another thing that is cool about it, is in the family room it has a quartz fireplace — at least I think it’s quartz or marble. The only thing that is close to what we have is what Holyoke Cindy has too — I’ve tried to research if that was a thing in the 50s, but haven’t come up with anything besides that photo on your site. ‘ve attached a few photos of the bathrooms. Fyi– only needed to do a few things to fix them up inspired by your site: Bradbury&Bradbury wallpaper, replacement Crane faucet knobs from Deabath, and “satellite” pulls from Rejuvenation. The master bathroom is the pink and gray one with all Crane fixtures, the half is American Standard with pink tile and green sink. 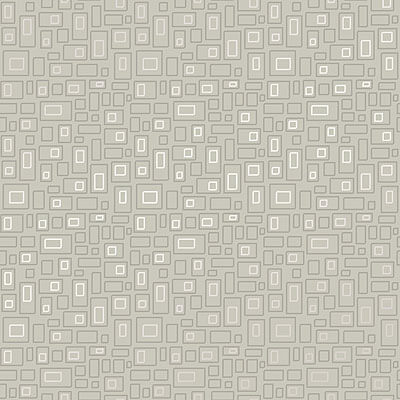 Irreplaceable linen pattern Formica in the master and a hudee ring! One day I will focus on finding a matching green vintage toilet for the half-bath, but the current Home Depot model is new, so I hate to just toss something perfectly usable. 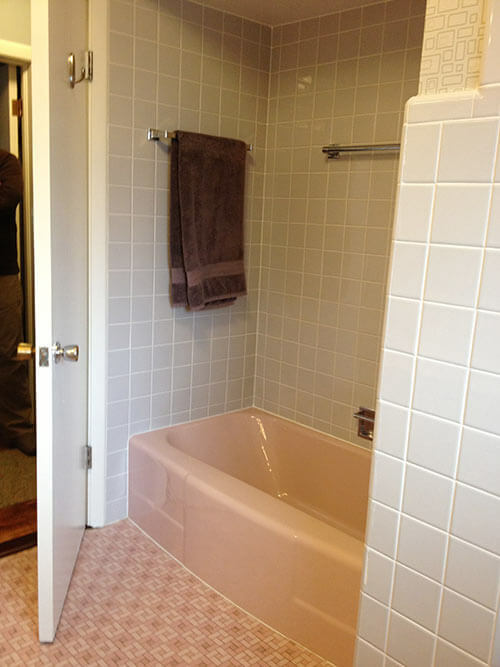 There is a matching full pink tub in the master as well, and shower is all pink tile inside. 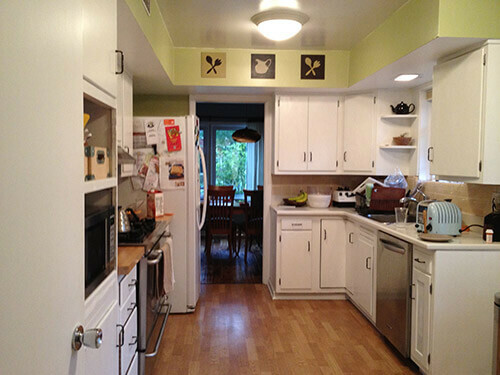 On another note, I also have been meaning to write to you because I have lurked on the blog for a long time, and really used it to put together my spanky new kitchen renovation. My style is not kitschy or DYI (although I admire those who are! 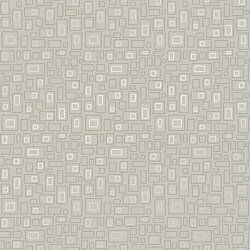 ), but more modern inspired — we have a fair amount of mid-century furniture — authentic and re-issues. And the vintage kitchen here was so sad– really chopped up and painted over, with holes in the walls and icky Pergo floor. Just not restoreable at all. So, I dumped the whole thing — including the soffits, sorry! and redid with Ikea cabinets, Marmoleum floors, and backsplash tile from Modwalls (I think I originally found them from Atomic Ranch, but I see they advertise with you now too). Almost all the research and inspiration came from specific stories from your site. 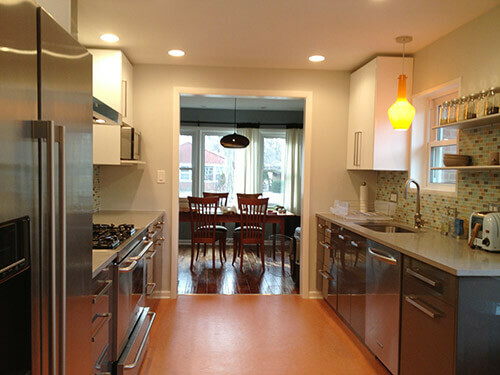 The last photo is one view of the finished kitchen, with groovy Jonathan Adler pendant — I love his stuff. So you and your blog were invaluable to me and I wanted to tell you that I thank you very much!! Brty, the amount of jealousy that I have for your two gorgeous pink bathrooms is unreal — I’m so glad that your son and husband have agreed that the pink is here to stay. 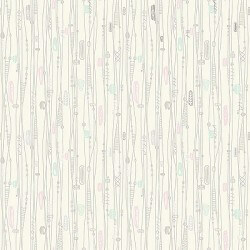 I’m also loving the Bradbury & Bradbury wallpaper that you chose — it helps balance the old and new wonderfully. 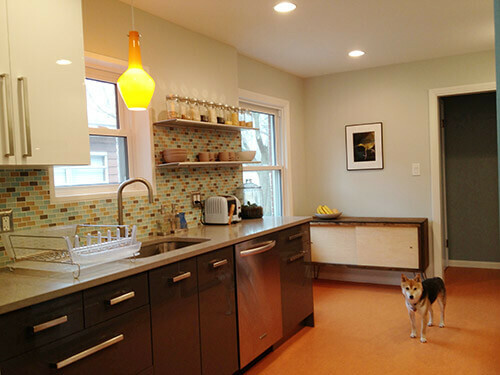 Your remodeled kitchen is also very nicely done — especially your use of bold color in the orange Jonathan Adler pendant light. Congrats on a job well done, and thanks for sharing with all of us in the Retro Renovation community. 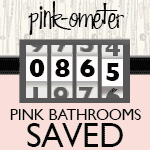 Leave a comment on our Save the Pink Bathrooms Pledge Page, and we’ll add you to our count! 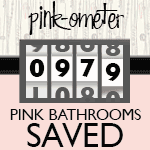 Paint + stenciled bumble bees transform Lindsay’s vintage pink bathroom — delightful! 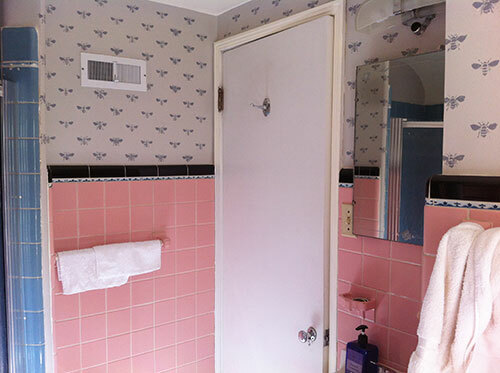 Retro Design Dilemma: Paint colors or wallpaper for Diane’s kitschy pink bathroom? Wonderful job! Amazing that those old baths were built well enough to “live” over 50 years. Kitchen is just right too. What fun for you and your family. Great bathrooms and nice work on the kitchen! 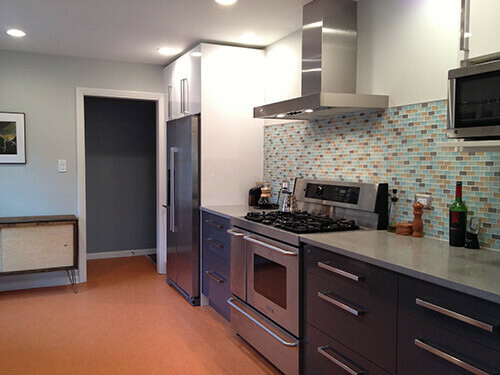 We too did a new modern kitchen with a twist or retro, they can really work well in mid century homes. What floor is that in the kitchen? MikeD, in the article, it says the floors are Marmoleum. Very pretty choice. The kitchen floor is forbo marmoleum “African desert”. There are so many beautiful colors to choose from. 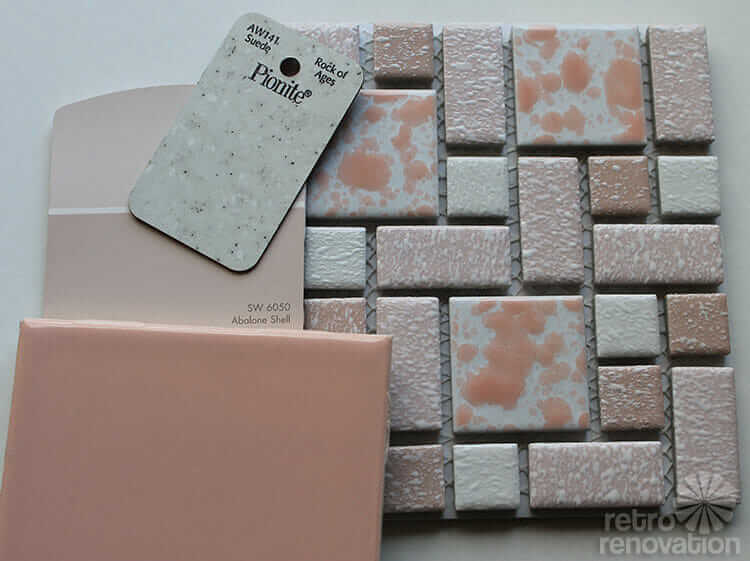 I’m in love with both baths, but the pink and gray one is simply fantastic. 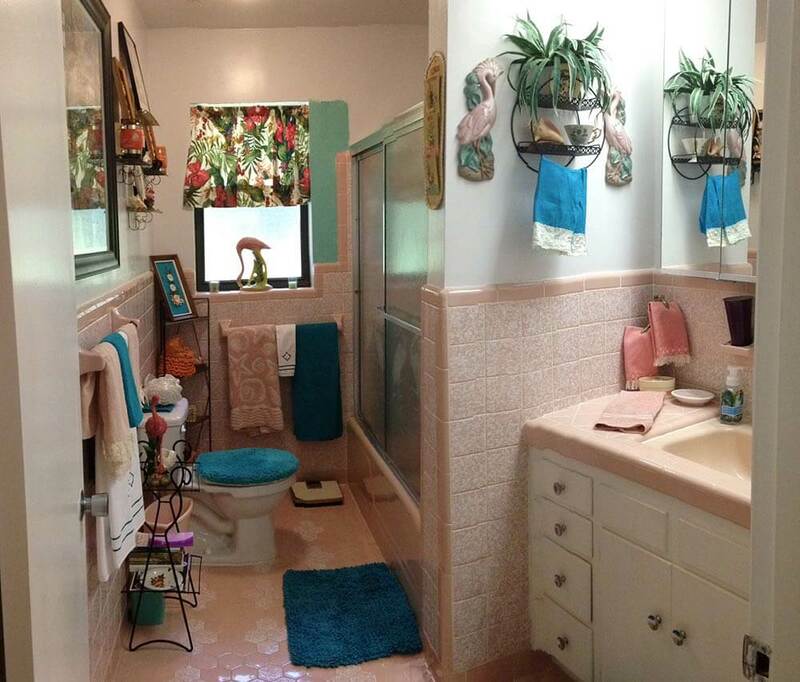 My working class pink bathroom pales in comparison! Beautiful job! 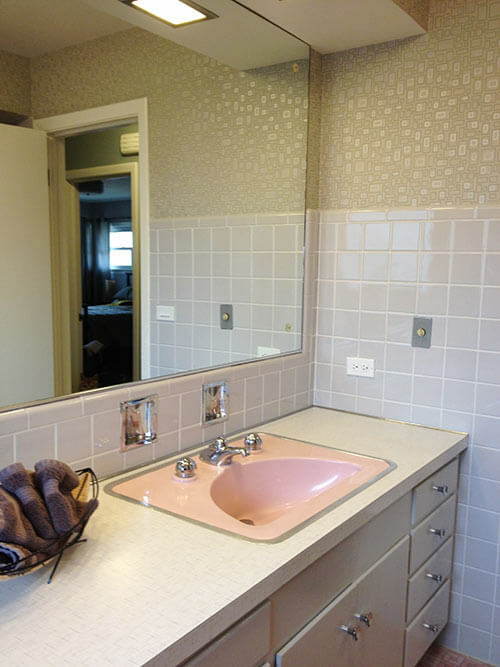 Love the pink bathrooms, and I have always loved the big landscape mirrors and the way that they tiled around them. Just dreamy! “Landscape mirrors” – never heard that term before, but wonderful description. Big fan of them myself. They are so much more functional for a family with people of different heights, than those dinky things with the big clunky frames that are in so many newer homes.